I’ve been breezing through my 30-by-30 requirement of preparing three new ingredients at home. Not only did I just try kale, I recently picked up some fresh figs. I’ve had fig sauces and glazes on meals out in restaurants but definitely had never even seen a fresh fig in person. I had seen this appetizer in my Google Reader and immediately thought of it for a picnic dinner I was planning with Hubby. 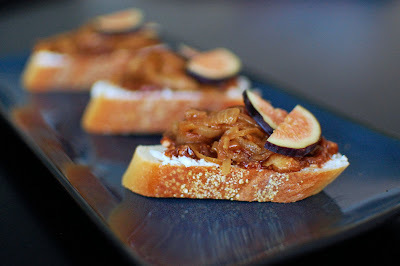 Anything with goat cheese or caramelized onions is good in my book. Put them both into one bite of something and I’m in heaven. While the fig flavor didn’t dominate these little bites, you could still taste it. It was a great compliment to the caramelized onions and goat cheese. I highly recommend making this the next time you need an easy appetizer that looks and tastes quite impressive. Everything can be made ahead of time and then assembled just prior to serving. Cut figs in half and scoop out the seeds and pulp with a spoon. In a small saucepan, add the fig seeds and pulp, balsamic vinegar, honey, 1/3 cup water, and a pinch of salt. Stir to combine. Bring to a boil and then simmer for 5-10 minutes until thickened. Spread fresh goat's cheese on toasts and top with freshly cracked black pepper. Spoon balsamic fig reduction over the goat cheese and top with caramelized onions. 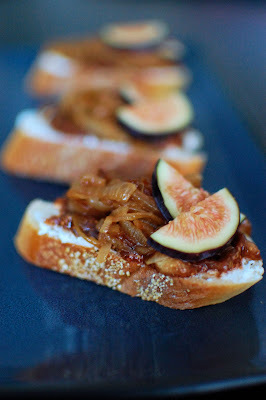 Add a little slice of fig to the top for presentation. I do the same thing on Friday nights. Totally acceptable. 🙂 The cake looks gorgeous! This looks amazing!!! Great choice of convenience item to make, and what better way to use it than in a layer cake!?!? Beautiful cake, Jen! I’ve never heard of a filling made from dried fruit, either. Must try it soon! It was a lot better than I was expecting for sure! Sounds like a great combinations of flavors. Layer cakes are the best! Those are some delicious flavors going on. It looks great, too.